Quartz Crystal Microbalance with Dissipation monitoring (QCM-D) permits on one hand in-situ screening of very small mass changes and on the other hand yields information on changes in structure, viscosity or stiffness of a material. QCM-D measurements benefit from the relation between eigenfrequency and mass of a quartz crystal. By using alternating voltage the quartz crystal is excited into resonance. If the mass of the crystal changes due to adsorption of mass (molecules, polymers, proteins, cells, etc.) 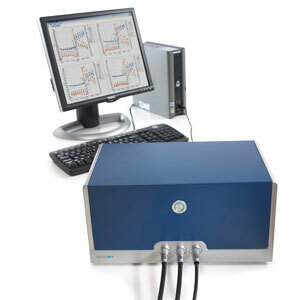 the resonance frequency changes, Thus very small changes in mass can be detected and analysed, even on nano-scale. At SuSoS we use a method that does not only follow the change of mass, but also monitors the dissipation. By this we also yield information on the stiffness, viscosity or elastic modulus of a material. Hence we learn something about conformation, swelling behaviour and structure of polymers as well as how molecules are oriented on a surface.